Open workouts and press conferences were held this week ahead of Bellator 149: Shamrock vs. Gracie scheduled for Friday night in Houston. Ken Shamrock is slated to face Royce Gracie, while Kimbo Slice will fight Dhafir Harris, better known as "Dada 5000." Royce Gracie and Ken Shamrock face off at a press conference for Bellator 149: Shamrock vs. Gracie on Feb. 17, 2016 in Houston. Tempers flare between Kimbo Slice and Dada 5000 at a press conference for Bellator 149: Shamrock vs. Gracie on Feb. 17, 2016 in Houston. Kimbo Slice at a press conference for Bellator 149: Shamrock vs. Gracie on Feb. 17, 2016 in Houston. 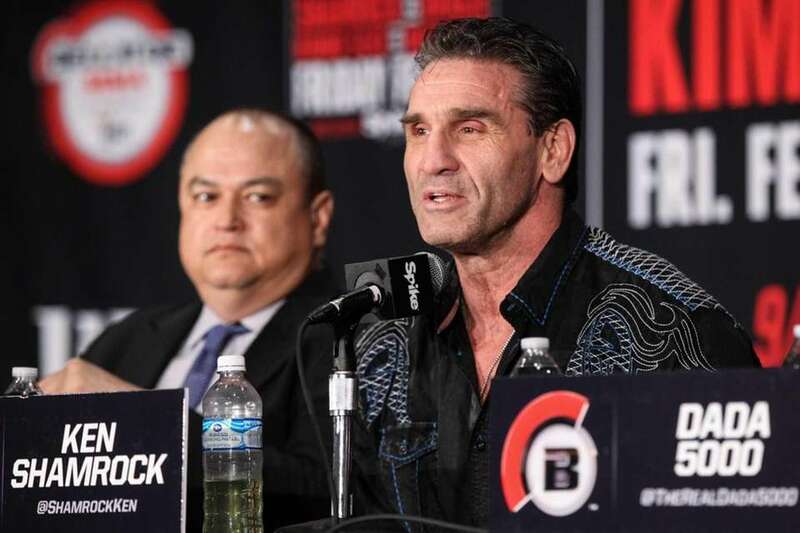 Ken Shamrock at a press conference for Bellator 149: Shamrock vs. Gracie on Feb. 17, 2016 in Houston. Bellator MMA president Scott Coker speaks at a press conference for Bellator 149: Shamrock vs. Gracie on Feb. 17, 2016 in Houston. Royce Gracie at a press conference for Bellator 149: Shamrock vs. Gracie on Feb. 17, 2016 in Houston. Bellator MMA president Scott Coker at a press conference for Bellator 149: Shamrock vs. Gracie on Feb. 17, 2016 in Houston. Dada 5000 at a press conference for Bellator 149: Shamrock vs. Gracie on Feb. 17, 2016 in Houston. Kimbo Slice and Dada 5000 face off at a press conference for Bellator 149: Shamrock vs. Gracie on Feb. 17, 2016 in Houston. Kimbo Slice at open workouts for Bellator 149: Shamrock vs. Gracie on Feb. 16, 2016 in Houston. Royce Gracie at open workouts for Bellator 149: Shamrock vs. Gracie on Feb. 16, 2016 in Houston. Dada 5000 at open workouts for Bellator 149: Shamrock vs. Gracie on Feb. 16, 2016 in Houston. Ken Shamrock at open workouts for Bellator 149: Shamrock vs. Gracie on Feb. 16, 2016 in Houston. Royce Gracie and Kimbo Slice at open workouts for Bellator 149: Shamrock vs. Gracie on Feb. 16, 2016 in Houston.